IELTS Examination Is No Hindrance - Gateway to Canada | Canada Immigration Consultancy! 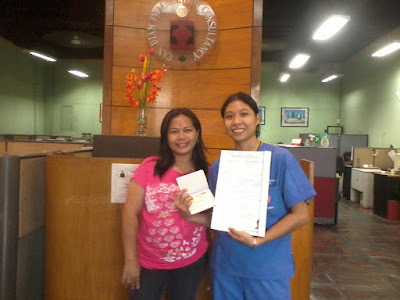 Ms. Marigold Rocero, a Registered Nurse, is one of those who opted for the Acedemic Module when they took the IELTS examination. General Training Module is the required module but there was a period in the past that Academic Module is being accepted. Thus, those with IELTS exam result ready, even if it's Academic Module, were submitted just the same in filing their application. But Citizenship and Immigration Canada eventually implemented strictly the rule on IELTS module requirement. Taking another IELTS examination did not become a hindrance to achieve her dream of living and working in Canada. As they say, if there's a will, there's a way. She went to Canada last November 2011 and is now based in British Columbia, where a Nurses Union is demanding additional 2,000 more staff nurses rather than pushing for any wage hikes. If it doesn't sound a great opportunity for her, I don't know what is. With Ms. Rocero in the picture is PIA Corp's Senior Documentation Specialist, Ms. Irene Delara. Interested to live and work in Canada, too? Click Here for Free Online Assessment.